We’ll show you the perfect recruiter resume in a minute. Better yet? We’ll tell you how to write one. You view hundreds of resumes every day. You know that spelling mistakes are a no and relevant experience is a go. And now that you’re about to write a recruiter resume, you’re paralyzed. You’re worried that in your case it’s not the cobbler's children who are the worst shod, but rather the cobbler. Not all recruiters are professional resume writers after all. So how can you make your recruiter resume stand out and land you that interview? A recruiter resume example better than 9 out of 10 other resumes. How to write a recruiter resume that will land you more interviews. Tips and examples of how to put skills and achievements on a recruiter resume. How to describe your experience on a resume for recruiting to get any job you want. Here’s a recruiter resume sample made with our resume builder. What’s the Best Format for a Recruiter Resume? So how much time did you spend on an average resume? Well, that’s because you’re nice. Cut that in half and you’ll know how much time others will spend on yours. You’re on the other side of the deal now. Same game, different rules. You need to catch their attention fast. That means your first focus should be on the resume format. After all, it makes you want to pull your hair out when you see a crowded, messy resume. If you’ve got a few recruits of your own under your sleeves, start with the best resume format for a recruiter with experience: the reverse-chronological resume format. This format emphasizes your recruiting experiences, your recruiter skill set and your numbers. Numbers are at the core of how staffing firm recruiters are evaluated. And the reverse-chronological format allows you to show the number of placements made over a certain period of time, and the amount of revenues you generated. List your most recent work positions first and go back through past jobs. Whether you’re looking to write an independent recruiter resume or a college recruiter resume, this format is perfect. All you need is experience. Easy to read and scan through, the reverse-chronological format will please your hiring manager and their best friend, aka the applicant tracking systems (ATS). But, what if you’re writing a staffing recruiter resume with no job experience? You need to show off. Ok, not exactly...but still, it’s at the entry level that you need to show enthusiasm. If you have no work experience, the chronological format still works best. Just start with your education and internship experience. Writing a career change resume? If you don’t have the exact experience to talk about, then you need to talk about something else. And this is where the combination resume format will come into play. It allows you to highlight relevant skills and achievements from past jobs in bullet points. List them under relevant subheadings like: Networking. Pick and choose transferable skills to match the entry-level recruitment job position. This will make your recruiter drool over the potential commission he’ll get when he hires you. Eyes on the prize, junior recruiter resumes can close deals too! Pro Tip: If you’ve struggled before reading resumes on Applicant Tracking Systems you know not all PDFs are machine-readable. Check the job offer to make sure whether they’re .doc or PDF! Recruiter Resume Summary or Resume Objective? You want to catch the recruiter’s eye. In fact, you want to catch their heart. You want them to love you like Google and Facebook love their best tech recruits. You want them to hire you, pamper you, and nurture you. So follow your own advice: don’t be average! Your recruiter resume objective or resume summary is just like that first intro line you throw at a cocktail party full of potential recruits: it’s either a deal-breaker, or a deal-maker. But which heading statement is which? A resume summary shows you have a PhD at the art of herding people. Use it if you’ve got boatloads of experience you can, well, summarize! Use it if you're a senior or executive recruiter or if you’re writing a recruiting coordinator resume. A resume objective works if you were fascinated by Gerard Butler in A Family Man and thought his job was cool. Use it if you’re not there yet but you want to get your foot at the door. Recruiter skilled in networking, negotiating and hiring. Talent assessment and acquisition. 6 years experience. The recruiting industry holds no prisoner, if you snooze you lose. So if you’ve been around a long time, you must’ve done one thing or two right. Results-driven recruiting manager with 6 years experience and the proven ability to motivate personnel to reach individual and industry targets. Increased company profits by 21%, reduced time to hire by 20 days and ranked #1 revenue generator. Now this smells more like some moolah is about to be cashed in. This sure looks like the best recruiter resume sample out there. This eye-grabbing IT recruiter resume summary will get the hiring manager to devour the rest of your resume. You’ve just graduated and you were smittened by what’s recruiting can offer you? Shiny new laptop, high-tech phones, luxury corporate vacations, team building activities, flexible commission structure, in-house development…the sky’s the limit when you’re in recruiting! But before the dream comes true, you’ve got to hustle. After all, you’re a career virgin, why should anyone hire you? Let’s have a look at our resume objective book of business. Driven entry-level recruiter, with good people skills. No real-world experience yet, but eager to start in the recruitment industry. It’s not the worst we’ve seen but this screams average. Blended with 300 other college graduates, and we have no job for the next six months. Wait, don’t close the tab on us just yet. All you have to do is add accomplishments and you’re a future star performer. Energetic college graduate with a degree in Human Relations. Skilled with social media and looking forward to using it to source and place the best candidates out there. Can negotiate with anyone and diffuse the tesest situations. This says a lot about your character and that you’ll do whatever it takes to exceed targets. Forget Arabian horses, with this entry-level recruiter resume objective, the hiring manager will want to turn you into Eclipse. Pro Tip: Don’t show all your cards just yet! Avoid jamming everything into your HR recruiter resume objective or summary. One or two impressive facts are enough. She’s a recruiter just like you. Except, she’s in charge of hiring you. You want to get on her good side, don’t you? You want to be part of her coveted book of business. That list of candidates she’s spent time meeting with, vetting, and training for future interviews. Recruitment is essentially a sales role. And guess what? Your recruiter resume needs to sell you and your experience. Just like any other organization or company, an army recruiter is essential in hiring the best talents building the future of the nation. Your mission should you choose to accept it, is to pick the best recruiter responsibilities that match the army’s interests. Army recruiters generally complete duties like visiting schools and communities, presenting military employment opportunities and answering any questions potential soldiers might have. Conducted market research and analysis to determine proper recruiting techniques based on demographics and backgrounds. Prospected for, processed, and hired over 65 qualified applicants into the A/1-15 INF over a period of 24 months with a zero rate of loss. Contributed 30% of the mission for the largest A/1-15 INF recruiting station in Texas. Awarded Recruiter Ring in less than three years, one of USAREC’s most coveted awards. This screams “Uncle Sam really wants you!”. Clay Usie would be proud! Let’s have a look at the next army recruiter example to avoid any career termination. Managed all recruiting responsibilities and duties for the U.S. army. Conducted interviews and spearheaded the recruitment process. Implemented interview and training processes to place the best talent. This army recruiter resume sample isn’t exactly deserving of a battle cry. But to give it a medal of honor, all you need is achievements. Not exactly in that experienced, all-star space yet? Don’t worry. Writing a recruiter resume for an entry-level position doesn’t mean you can’t leverage your past experiences to break into recruitment. Think about past non recruitment related jobs and activities. Have you ever assisted with onboarding and recruitment of club or non-profit members? Were you a badass in selling second hand clothing to eager fashionistas? Ever put your networking skills to get funding or endorsement for a college project? There you go, I’m sure we’re sparkling some memories here. After all, a recruiter is essentially a sales and networking job. So think about those moments in your life when you performed those duties. You can list them on a recruiter resume for fresher even without the official title. Assisted with administration and fundraising for The French-American Club at Northwestern University. Organized networking and socializing events to on-board new club members via social media. At a small retail store, cultivated and maintained strong relations with company vendors. Wondering how to get some experience like that? Get involved with a club in your college or find an internship where you can help with hiring. Pro Tip: Don’t forget social media! It has become a key recruitment channel. So if you’re the King of LinkedIn, Facebook or Twitter, make sure you mention it. Focus on developing next level skills like creating Facebook pages and running social marketing campaigns to get into recruitment without any experience. The recruitment industry is one of the few high-performers industries where you can just wing it a la Wolf of Wall Street. Drive and personality are ultimately what seals the deal. Especially if you’re writing a junior recruiter resume or recruiter resume with no experience. This is your home run. She was right. Kind of. We’re not here to be average, are we? If you want your resume to catch the recruiter’s attention like a big fat commission check then do this: add your education bullet points to match the recruiter job description. 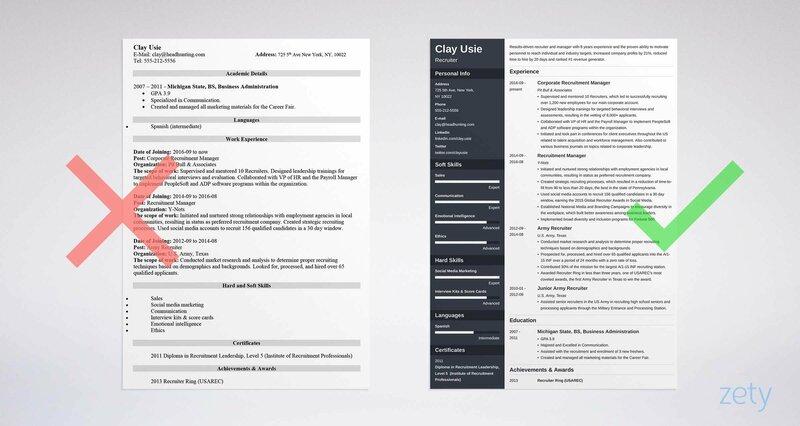 Check out these two professional recruiter resume samples. This is basic. It could be anyone, whether they’re applying for a recruiter job or a teaching job. Plus, is that GPA really worth mentioning? Instead, show Suzie you’re top of mind material. Majored and Excelled in Communication. Assisted with the recruitment and enrolment of 3 new freshers. Created and managed all marketing materials for the Career Fair. Now we’re talking. Suzie will call you right after reading this. Pro Tip: On your recruiter resume, only include your GPA if it’s as close to 4.0 as possible. If it’s too low, it will hurt you more than help! When you receive job applications, you sometimes wonder if people are trying to intentionally make you hate them. Ok, maybe hate is too much of strong word. But there are definitely resumes that made you do a slow burn. Recruitment is one of the most meritocratic industries going. The more you put in, the more you get out. So you need proof. Proof that you’re the next million dollar biller. Check out these two these two professional examples of recruiter resumes. Now let’s put them on the payroll in your recruiter resume. Follow the second list and you’ll get the door at your face. With the first one, you’ll get your foot in the door. The skills section works as a convenient checklist and is great for resume keyword lists. Just don’t keyword-stuff your resume. Your colleagues will know what you’re up to! Pro Tip: Weed out excessive flourishing and exaggerated descriptions. Some recruiters may consider them inappropriate! Fly-by-night recruiters will often charge in like a bull in a china shop. They don’t have personal integrity to protect nor do they care about the employer’s brand. You on the other hand can spot a flaky candidate miles away and are always a step ahead. How can you prove those things on one little sheet of paper? You can use targeted "other" sections. Publications, accolades, awards, even hobbies make a great addition to an executive recruiter resume. The idea is to show you’re the cream of the crop. The deal worth chasing. Volunteered to handle recruitment for local youth group. Recruited and coached student organizations from colleges throughout the state of New York to participate in the Terry Fox Run for Cancer Research. Offered consulting services to train a small nonprofit in company culture. Article on the future of job searching in Recruiting Times. Interviewed by the The Five O’Clock Club about what makes a good resume. Recognized as Rookie of the Year 2015. Best Use of Social Media at The Global Recruiter Awards 2017. With these, Adecco, Hays and Randstad will come knocking at your door. Pro Tip: Don't have any cool details to add? Try volunteering or leveraging social media to do some small projects. As a recruiter, your job is to put the right people in the right jobs. Your recruiter cover letter can help do the same for you. Would you consider a candidate who didn’t include a cover letter? With no cover letter, you wouldn’t even bother reading through their resume. Even if we know you don’t even read cover letters in the first place. Don’t worry, your secret is safely guarded. First, get personal. Not creepily personal. Just the right amount to get some attention. Find your hiring manager’s name on LinkedIn or by calling in and address your letter to them. Then, mention a fact or two about the company that literally makes you tingle with excitement at the idea of working for them. Use your networking skills to connect with current recruiters working for the company you’re targeting and get the insider's tips to win the deal. Writing a good recruiter resume for recruiters is like preaching to the priest. Or giving a haircut to a hairdresser. The same resume expectations you have should also be practiced on you. So, how to write the perfect recruiter’s resume? When looking for your next opportunities, be confident and make sure your accomplishments are well presented. Recruiting is a highly social profession, so if you can, include a resume reference page and testimonials from professional contacts in your industry to support your recruiter resume. You’ll stand a better chance at landing your dream job if you show you’re not only endorsed by other peers, but that you can also be a company’s eyes and ears in the field, offering industry insights and advising on the most in-demand skills of the moment. What do you think matters most on a recruiter’s resume? Did we miss something? Tell us what you think in the comments!